We have some exciting news at Where’s Sharon – we are moving to Asia on December 31! We are not moving with a company or going to teach English. We are moving to become digital nomads. 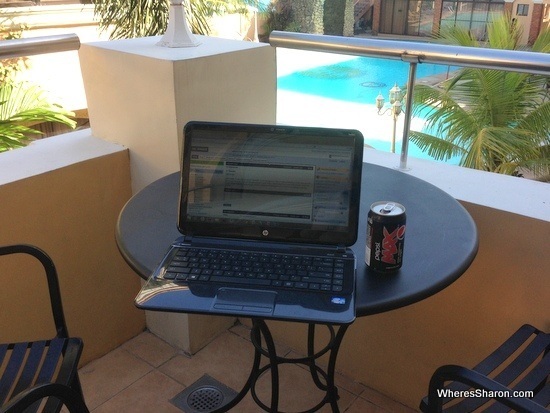 1 What is a digital nomad? 2 Why move to Asia? 3 What about the kids? A digital nomad is basically someone who works online (the digital part) and travels (the nomad part). It is something we have wanted to be able to do for a long time, ever since I first read about families who do this a couple of years ago. 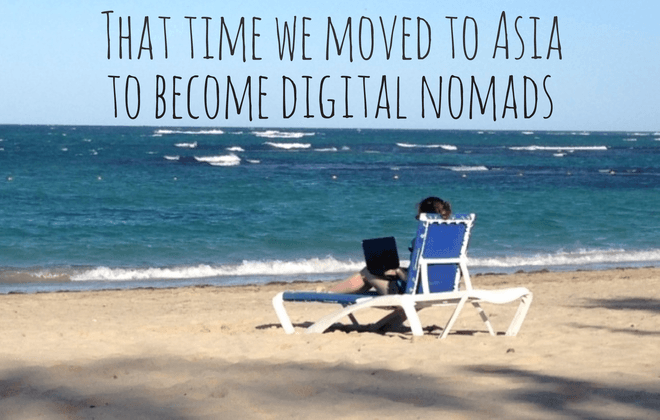 Read more about what a digital nomad is and why we want to be ones. Many people work online. Some do freelancing work, using sites like oDesk, and some start their own online businesses. The latter is what we want to do. We want the flexibility and freedom which can come from having our own online businesses. I am already working hard on several ways to make money online and I do already make some money from this site. J makes a little bit of money from a software product he part owns and has some other ideas of how to make money with software products. 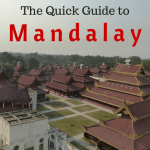 If you want to know more about how we are earning money online, I blog all about it on my other blog – Digital Nomad Wannabe. It is so much cheaper to live in Asia than Australia. We will be able to live on less than half of what we do now and have a much better lifestyle as well. This means that by moving to Asia, we are buying ourselves time. J won’t have to work on other things, so he can dedicate all his work efforts into this as well. It also means that the amount of money we need to earn to sustain ourselves is a lot smaller and more achievable than if we stayed here in Melbourne. We have enough money to live there for about six months, so this gives us quite awhile to try to make an online income work. 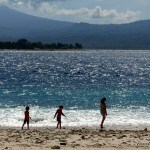 It also gives us a lot of opportunity to travel and see even more of this great continent. It is definitely not a hardship to move to Asia. We can not wait! They will come too of course! S is very excited about the idea and wants to live in Malaysia and have dad at home every day. Z is less able to talk about it, but we have no doubt that they will both be happier in an environment where we can both give them far more quality time than now. This is also the ideal time for us to do this. S does not start school until 2016, so we have a bit over a year before we have to worry about that. They will be able to go to preschool in Asia. At the moment, we are committed to returning to Australia for school. We are excited! J is also a bit scared, but really the worst case scenario is that we can’t make an online income work for us and we come home after six months. There is nothing bad about a scenario which involves us spending six months together in Asia! It is a bit scary putting our plans out here like this though. I worry about feeling like a failure after I tell the world that this is what we are going to do if it doesn’t work out. However, logically I know this is silly and I would be a far bigger failure if I let what other people think stop me from pursuing an awesome opportunity for me and my family. Besides, if I let what other people think stop me from doing things, then I would never have taken two x one year periods off work to travel or travelled with young kids, and obviously these things have worked out very well. We will continue to work on our online businesses until we leave. We post monthly income reports on Digital Nomad Wannabe if you are interested in reading how we are progressing in meeting our income goals and the different things we do to make money. 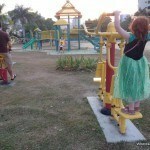 We will continue to blog about our family travel adventures and our experience in moving to Asia on Where’s Sharon. We also have a few trips planned for closer to home in the lead up to our departure, so look out for those. We are also working out exactly where in Asia we will base ourselves. Read about it in our post about where we will live in Asia. I would love your input! This has now happened! Read more about living in Asia. In the meantime, what do you think? Crazy or awesome idea? What an exciting time! We’ve been racking our brains on how to get there — that nomad dream place– as well. Good Luck with it all! There are so many possible ways to make an online income and no guarantees so this move has really been a couple of years in the making for us. Good luck! Hope all your preparation for the big day are going smooth! No question at all – it’s a great idea! Maybe we’ll catch up somewhere in Malaysia! I can imagine your excitement! We do have the same plans, we are working hard in our internet business and we were almost in the right time to move when we decided to buy a house! The thing is that we live in Playa del Carmen and as it’s a touristic place we think it’s a good idea to rent it out and pay the mortgage with it. So now we are buying stuff for the house and then we’ll be able to make the move to Asia too. Where do you plan to move for a base home? We think about Chiang Mai. Did you think about home/world schooling them? I have thought about home/world schooling but as someone who is a registered teacher, I worry about the work load while they are young and have a lot of building blocks to learn!! Thankfully, they dont start school until 2016, and I have actually just accepted an offer for S to attend a fabulous bilingual school here in Melbourne, so we will be back home for that. We did the house thing. Thankfully, we already rent it out and rent ourselves so that removes one hurdle. Playa del Carmen is such a beautiful place. If Mexico wasn’t so far away, we would base ourselves there. At the moment, I think Penang will be our base. I have looked into Chiang Mai as well but I don’t think it suits our needs as well. I think it is an awesome idea! Good for you! That is really awesome! I have butterflies just reading this and I’m not going! Haha! Very happy for you and your family. I hope that I too will be better at earning income online to do the same one day! Good you for you! Here’s to adventure. Thanks Hot Mama! I have too many butterflies after publishing this and purchasing some flights this morning that I am struggling to do any of said work! I used to worry about telling people plans and it not working out, too. Before moving to Korea to teach English, I needed reassurance that if I didn’t make it the whole year, I wasn’t a failure. Luckily my friends and family helped me to see that not taking a risk to follow my dreams would make me a failure, not trying something and it not working out. (And, of course, it did work out, but that’s not really the point) Good for you! Yes exactly, Alli!! Like they say, better to regret something you did do, than you didn’t. I can’t see us having any regrets though regardless of how it turns out. Wow! Such an amazing, and enviable plan! Sounds like you have worked hard to get to this point – now just to make the jump! This is what I would like to do when I grow up……ha – I am never growing up! Cambodia would always be my vote for a great nomad life! How exciting. I would love to up sticks and live in Asia for a while. I’ve always dreamed of the east coast of Malaysia, and you’d have better internet than Australia! Exciting and totally awesome!! And you’re right whichever way: it will turn out fine :)! 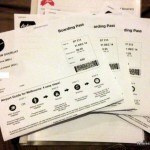 Good luck with the digital nomad adventure! Great idea, Sharon! We did get a feeling that this was something you really wanted to do. So, you did a first step toward your dream – decided to follow it. Good luck to you guys. I am sure everything will work out for you. Woo Hoo! It’s about time! Congrats and look us up when you arrive. Inspiring! Best of luck to you all! For the record, I do know a couple of friends who set out to spin their UK working holiday visas into something more and failed. Do we think less of them? Of course not. Did it ruin their lives forever? Because they had a great stay in Europe and got to travel around even if they didn’t land much of a long-term job? Are you kidding? Yeah exactly. It is interesting how silly our fears can actually be when voiced out loud. We really have nothing to lose as long as we look at the experience aspect and not the money aspect – and I personally do not see the point of money if it is not to help you enjoy your life!! Thanks! It is good having that schooling deadline as it finally got my husband off the fence about giving it a go and an incentive to stop just thinking about it. Hi Sharon. We spent six months in Asia this year, originally we are from the UK but had lived in Spain for five years because we had an online business. After reading travellers blogs and getting terribly itchy feet we sold all our stuff and arrived in Bangkok with back packs and two kids who we had just de registered from Spanish school. We originally planned to travel for 18 monhs to two years but we hit a few stumbling blocks, a very home sick nine year old girl (she got dengue fever in Bali) and a work problem that would just not go away. So we are back in Spain and probably going back to the UK in Feb. Do we regret our giving it all up and trying? not at all, it was amazing, we went to Thailand, Vietnam, Malaysia, Bali, Australia and Cambodia. The kids, and us had the time of our life. I wish we had managed longer but it wasn’t to be at that time. We are now re-grouping and aiming to get back to Asia some day. We would love to live in either Cambodia or Chang Mai i think. The best of luck to you and wherever you end up, it will be amazing. Isn’t unfair that you get to go to Asia or the cheaper countries hassle-free while we can’t come to yours even for holidays? And, how ethical is it to abuse the legal system, overstay as non-resident and pay no taxes while benefiting from government services and infrastructure? Hi Ahmed. I can’t say I understand how we would be abusing the legal system, overstaying or paying no taxes, unless we happen to move somewhere that doesn’t tax any goods or services. I make it clear that we are only interested in places where we can stay legally. There is a reason why governments allow people to come to their countries in the first place – we will be paying for all our living costs and all services from money we earn outside the country. This means we are contributing to the local economy. I can’t comprehend how exactly you imagine we will be giving more than we take, if that’s what you are trying to say. I agree that it isn’t fair that being Australian means I have more freedom of movement than people born in some other countries. I don’t think it makes me evil that I am willing to make use of that freedom of movement though. Sorry if my comment did come off as aggressive. I didn’t mean that. I have a lota friends that I do love and enjoy who are in your situation. Let’s say that I don’t care largely, but let me explain my point of view. Economic policies are controversial and often only benefit few groups at the expense of other groups. That is just inherit in politics. Let’s acknowledge that. Now, let’s say I come from a third world country (I do actually) and I am in the group that don’t benefit immediately from you moving in on a visit visa. Normally, you wouldn’t be more of an upper-middle class family since you have another life somewhere else. How much willl you contribute that a local can’t really if we look at this on the micro-level. From a local upper-middle class perspective I can see that your “presence” is not necessary. Why? Since I can’t simply “visit” your county either, as a rule of thumb, I think the same laws should also apply to you. That’s what many countries do already. Check reciprocity visas in Latin America for American citizens for instance. You require visas for my citizens. I require visas for yours. I think it’s only fair. I don’t know where you’re going in Asia (Asia is huge and has many countries), but I assume that you may cross countries that have ill tax systems perhaps with some easily recognizable loopholes. These countries often heavily tax income to provide public employees wages and government services. You may be paying other taxes such as some sales taxes and other taxes, but they’re often not so important as the tax income that you will not be paying. Do you plan to apply for a residence permit in each country you visit? And lastly, RE: your legal stay, even when country A doesn’t require visas for aussies, they assume that you’re coming for some specific purposes (tourism, business, family visit, short stay, etc.) if you really dig deep you can’t just hop in and decide that you suddenly you want to stay or work (even if it’s on the internet). If you do so, you’re lying about the purpose of your visit which was assumed to be tourism in the first place. Although you’re not liable to state your travel motives, I think morally you’re taking advantage of a loophole in the system. I won’t even get started with “visa re-runs.” I actually read this in a book today. The morale: It is ethically wrong to take advantage of countries with loop holes in their tax/visa system. And, I love your blog! Very refreshing. We share a lot of goals with regards work and travel. I’m planning to go to Asia soon. Looking forward to read about your updates. Hi Ahmed, some interesting thoughts. Does this mean you are also against tourists in general visiting your country? As really, I don’t see what we are planning on doing as anything different to that. We will have similar costs, the only real difference being that we will rent an apartment rather than stay in a hotel, although we often do that anyway, and that we will pay for child care. I can not think of a government provided service we would be using that we wouldn’t use as tourists. I can see your point about lying on entry. I hadn’t looked at it that way. I don’t think that completely applies to us, as we are unlikely to stay anywhere longer than 3-6 months and saying we are there for tourism is not a lie, its just not 100% of the reason – they don’t generally give you the option to select more than one thing anyway. We will be travelling a lot, we already have a trip booked for every month of the first few months and I’m sure we will do more than that. I would definitely consider us tourists, not residents, but I can see how the line is blurred. Your points actually make me think of the controversy in Australia about asylum seekers and our immigration policies. Lots of people do not want any immigrants as they do not see the benefit to them individually. However, if you look at the bigger picture, Australia definitely benefits from immigrants. I think it is similar with people who do what we plan to do. Overall, the money we will bring into the country benefits the country as a whole far more than any negative. How exciting, good on you for giving it a go! I’m looking forward to hearing your adventures. Good luck with your project! 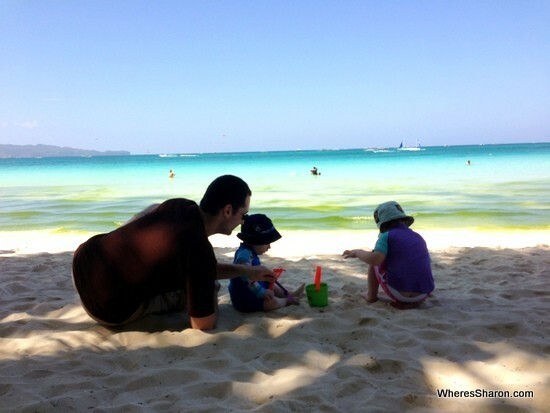 I like to read about digital nomad families since they are a few (but growing community). We are a French-Canadian family and 2 months ago we moved to Mexico (Playa del Carmen) to live and work online. We plan to live here 1 year and then move on to another place…Asia looks interesting! (but quite far away from North America). I think it’s great that you decided to travel with your children. It’s not as a complicated that people think, especially when they are young toddlers. It required more planning, but it can work! Thanks! I am jealous. We have always planned to live in Mexico for a year, and we still plan to at some point, but it is a bit far this time and we don’t want to spend half our money just getting there. I love Playa del Carmen. I hope you are loving it! And you are definitely right about travelling with young kids. When people ask me for my biggest piece of advice it is just to do it! Yes, definitely just do it it’s the best advice! And kids adapt very well. Congrats on taking the plunge 🙂 If you are careful you will have more than enough for much longer. Did you factor in what you will earn during the 6 months “based on todays numbers”? Let me know if I can help in anyway. Thanks! No we did not factor in current earnings at all so agree that we should be fine to go a lot longer 🙂 I do like to travel regularly though so that will take some of it! Thank you! It is going very well so far! So inspirational. I want to be a digital nomad right now! Perhaps that is a bit too hasty. But hey, if you end up really loving the lifestyle in Malaysia, I went to a local English speaking school in Brunei until the age of 12 before moving to NZ for high school. I found the curriculum challenging and comprehensive. Loved learning from a few different perspectives. Hi Rachel! I especially love hearing from people who grew up internationally. It’s great to hear that you had a positive experience. We are loving Malaysia. We are in Sri Lanka travelling at the moment, but whenever we talk of home now, it is Penang. This has been such a positive step for us. How did you enjoy the Philippines as a digital nomad spot? I struggle with reliable 3G internet there when moving around a lot. Have heard a fixed PLDT line is doable if you have a long term rental lease. Hi Dante! I don’t remember having any problems with the internet when we were in the Philippines. However, I was not a digital nomad then so my standards were much different! Becoming a digital nomad is so great idea! I’ve beet thinking about this opportunity all year and I ended up with planning where to move first. My husband and I are already organizing our move to the Philippines for the beginning of the next year. Yes, we decided to do it and already fixed some important dates. So I moving to Asia to become a digital nomad too. Greets! Hopefully things work out, you seem like smart people so I’m sure you’ll do great!